Although Renault didn’t create the mid-sized MPV market sector, it did help to popularise it in the late 1990s as the Mégane-based Scénic captured the imagination of European buyers who appreciated both its compact dimensions and innovative maximisation of interior space. Now in its third generation, the Scénic, together with the Grand seven-seater version driven here, has been mildly facelifted in an attempt to generate interest as buyers have migrated towards rivals’ offerings. But is it enough to stem the flow? Styling is always both a subjective and emotive issue but for me the current incarnation of the Scénic family is the least aesthetically accomplished of the trio. The first was pert and simple, the second pushed upmarket with its shrunken Espace look, but this one is a complex conundrum of themes, none of which particularly gel. There’s a greater distinction between the regular short Scénic and the larger Grand model, other than the length of the third side window and rear overhang but both appear to the estate bodies stretched vertically than traditional monovolume MPVs. Subtle differences appear in the reprofiled front bumper with variant-specific chrome trims leading to newly installed LED day running lights. At the rear, further minor tweaks feature and, as before, the boomerang-shaped tail lights curve inwards onto the tailgate on the Scénic and outwards onto the rear wings on the Grand. Much press coverage has been given recently to Renault’s rationalised range of models in the UK which has seen five separate lines dropped from the price lists, making the Grand Scénic the French firm’s largest MPV on offer here. That only tells part of the story for within each remaining model range the number of variants and trim levels has also been reduced. If you want a Scénic it now only comes in Dynamique TomTom flavour. 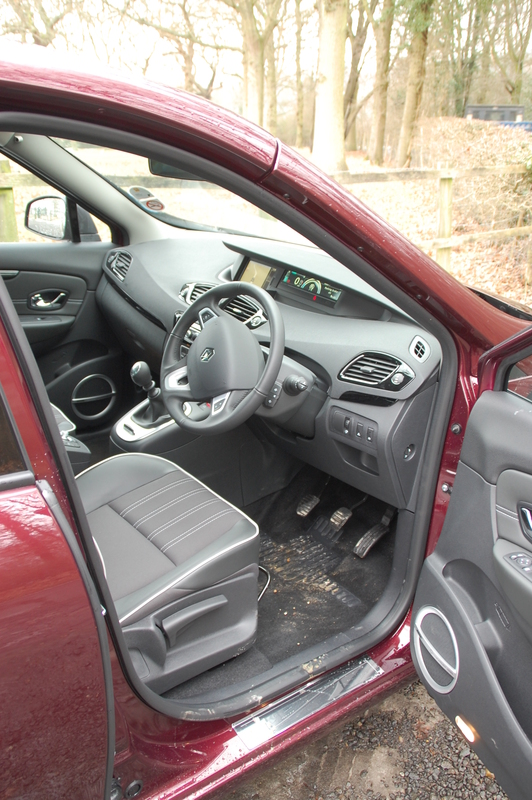 Whereas the Dynamique models used to offer a sportier feel than other trims like Authentique and Privilège, being the sole specification it now has to be all things to all buyers. The cabin is now a spacious but dark environment for you and your six passengers to travel but feels of substantial quality, with soft touch mouldings and a well-constructed feel. The adornments, both inside and out, have a classy, mature air to them too. 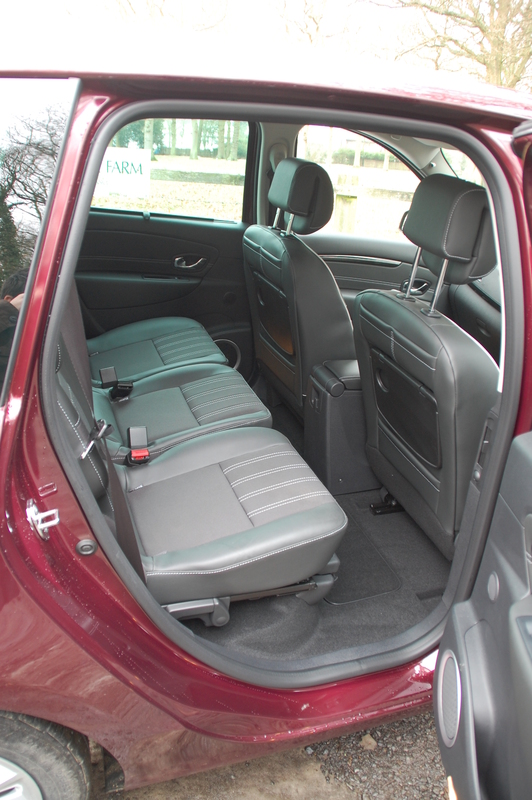 The dark grey seats have leather panels with light piping and the bodywork features additional brightwork. The Grand Scénic’s middle row of three separate chairs offers fine space and felt comfortable for adults when sampled but the rearmost pair are best suited to children and those of petite proportions. 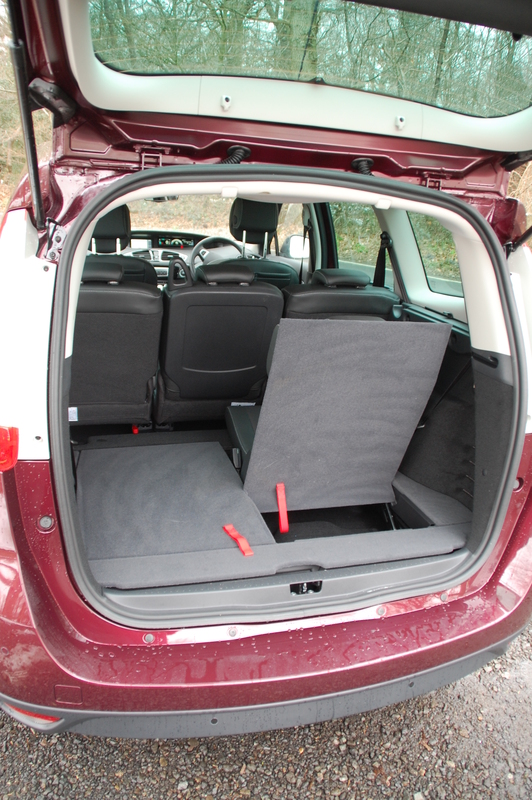 As is typical of the contemporary MPV genre, the third row folds flat into the floor with ease, maximising the Renault’s boot space and still providing ample space for five. 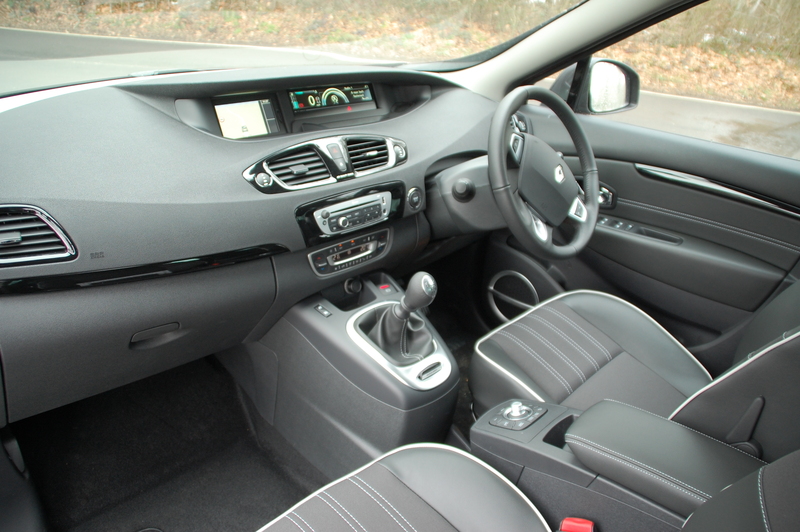 As well as the clever use of flexible space inside, it’s warming to see Renault has maintained some styling boldness with the dashboard itself, which is worlds away from the conventional facia fitted to the related Mégane range. Under that sweeping hood lies a full colour TFT panel for the instruments, gently changing colour depending upon how economical your driving is. It’s a welcome dose of fun and brightness in an otherwise austere interior. Tracking your economy is likely to be a common theme if you specify the latest version of Renault’s dCi common rail diesel engine in the Grand Scénic, with a claimed combined cycle consumption figure of 68.9mpg. During my brief drive, the high 50s seemed easily achievable, so with more careful application of the right foot the officially quoted figure could be within reach. 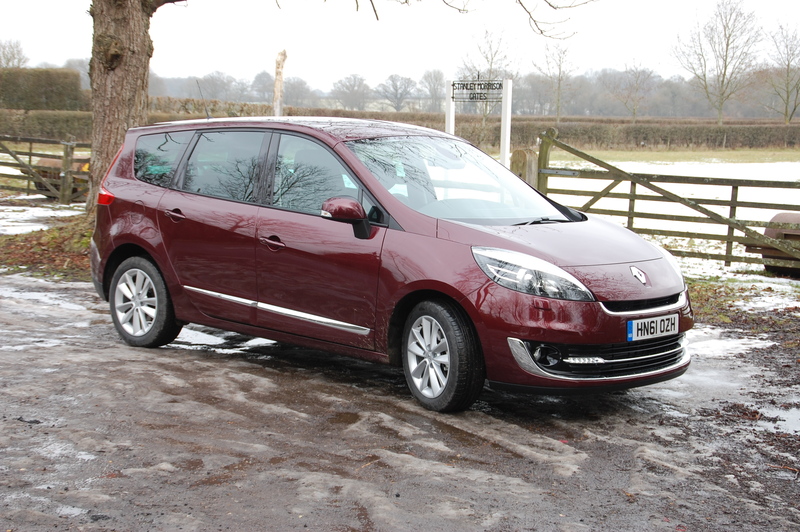 Needless to say, 110bhp from a 1.5-litre engine doesn’t set the heart racing and neither does it endow the Grand Scénic with blistering performance, not that many buy seven-seater MPVs for high speed thrills. The pace is adequate and the diesel engine itself is refined, smooth and quiet. The Stop & Start feature worked easily too, further boosting economy and keeping CO2 emissions low. If you prefer, there’s a slightly larger 1.6-litre 130bhp diesel available, together with a 1.6-litre naturally aspirated petrol and a new, turbocharged 1.2-litre 115bhp engine, which also drinks from the green pipe. In its role as a provider of comfortable family transport, the Grand Scénic has much to offer besides the space and ease of use. 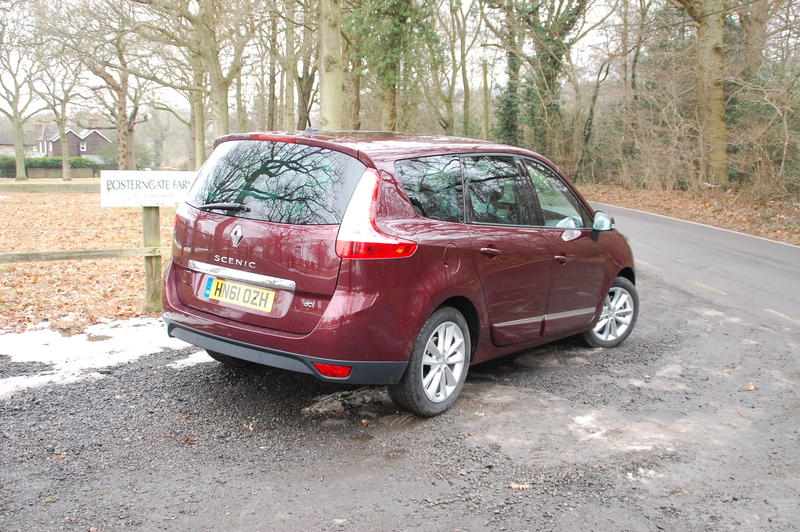 At most speeds and across the majority of surfaces, the Renault feels composed and comfortable, soaking up all manner of ruts, bumps and undulations with ease in typical French style. The downside is the vagueness in the steering feel and the tendency to list yacht-like around more demanding bends, although grip remains acceptable until understeer kicks in with vigorous driving. 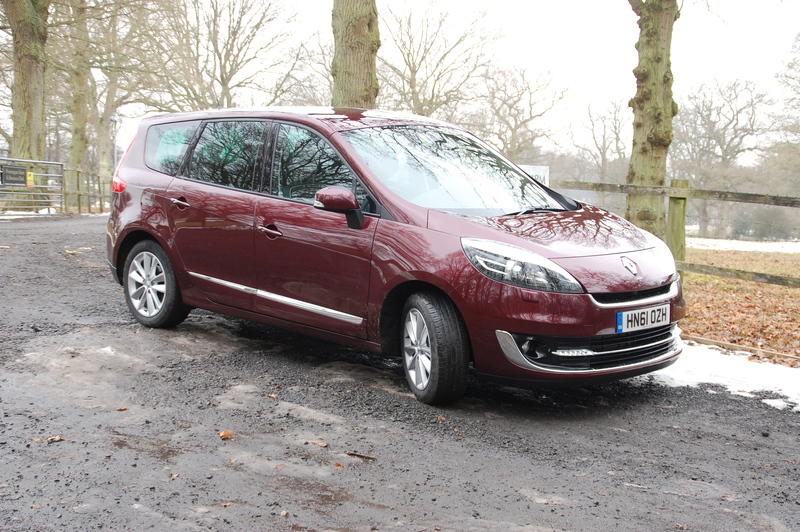 Is the 2012 Grand Scénic facelift enough to encourage buyers back to the Renault fold? The 2012 Grand Scénic range is a well-appointed, solidly-constructed seven-seater which offers fine economy from its latest diesel engine. Whether that’s enough to tempt MPV buyers back to Renault showrooms in significant numbers remains to be seen.